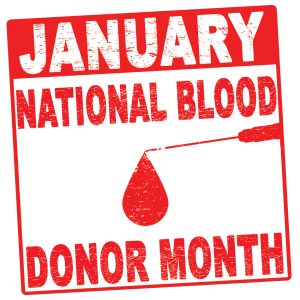 On December 31, 1969, President Richard Nixon declared January to be National Blood Donor Month? No? I didn’t either, but it is official. People often say, “since the beginning of human history” when they want to sound like they’re talking about something important. In the case, however, I can say with perfect accuracy that we have known about blood since the beginning of human history. Or at least we’ve know that it exists. William Harvey first described the circulation of blood and how the heart pumps it in the early 1600s. It was not until the 1900s that we began to understand more about it, when Austrian doctor Karl Landsteiner developed the ABO blood group system. Later, it would be refined to the A, B, AB, and O blood types that we know today. Following this development, Rueben Ottenberg would make the first successful blood transfusion in 1907. In Chicago of 1937, the first blood bank was opened by Bernard Fantus at the Cook County Hospital. Since then, there have been thousands of transfusions over the years. About 36,000 units of red blood cells and 7,000 units of platelets are needed every single day in the U.S. The Most requested blood type by hospitals is type O.All patients can use the O type, so it is highly valued, but only 7% of people in the world have it. The victim of a car accident may need up to 100 pints of blood to survive. 6.8 million people donate blood every year in the U.S.
38% of the population is able to donate, but less than 10% actually do. Donating blood is a simple, safe process.After a quick medical history test, the process takes only a few minutes and has no lasting effects, aside from the lives saved. A single donation can help more than one person. If you want to donate blood, it’s easy to do. To donate, you need to be at least 17 years old, weight at least 110 pounds, and be in good health. Certain medications and medical conditions (especially AIDS) will make you ineligible to donate, and you will be put through a short medical history check-up to make sure you’re clear. If you are, you can donate at any time you like. Blood donation centers can be found all over the country in every state. If you want to find a specific place, the American Red Cross has a handy app to help you locate blood drives near you. 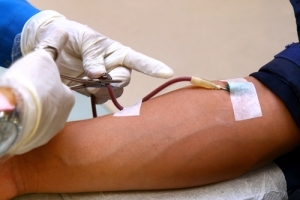 There are common fears associated with giving blood, but you really don’t need to worry. The screening before they take your blood will determine if you are healthy enough to donate, so you don’t need to worry about any health issues that may result. As long as you eat a good, healthy meal before donating, you won’t need to worry about a thing. If the sight of blood upsets you, that can be handled, too. Many blood donation centers will have TV screens nearby that you can focus on while the blood is being drawn so you never have to see it. And what about needle phobia? Well, speaking as someone who once had such a fear, the needle isn’t as bad as you think. If you don’t donate blood very often, then it can be nerve-wracking at first, but in the end, you feel no more than a brief pinprick. Once you’ve donated a few times, you find you get over the phobia very quickly. You might as well take the plunge; it’s an easy fear to get rid of and you help a lot of people in the process. The need for blood far outpaces the supply. Every time you donate, it gets put to immediate use. Just a ten-minute visit to the blood bank can save three lives at once, so you know you’re doing a good deed. Since you’re not donating money, you don’t have to worry about charity fraud either. Your donation goes directly to those who need it most. So get out there and donate today. You’ve got nothing to lose, but someone out there has everything to gain.